Grambling State University won the Bayou Classic by beating Southern University 29-14 in New Orleans. The game was a far closer match than the scores tell. Now The Grambling team will meet Jackson State in Birmingham on December 13 for the SWAC Championship. Meanwhile, keep in mind that the Alabama State football team totally shocked top-ratedTuskegee University by handing them their first loss in 26 games. On Thanksgiving Day, The ASU Golden Hornets defeated the TSU Golden Tigers 17-13. The Howard University Men's basketball team shocked the college basketball world with a win over PAC-10 team, Oregon State University (OSU). The game was a season opener for both teams and definitely not a good start for new OSU coach, Craig Robinson, brother-in-law of president-elect Barack Obama. 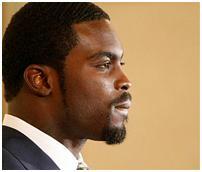 As expected, Michael Vick will likely plead guilty to dogfighting charges next week to attain early release from prison. Vick is serving a 23 month sentence. No doubt some folks need Vick in uniform and on the field as soon as possible. It's all about the Benjamins. 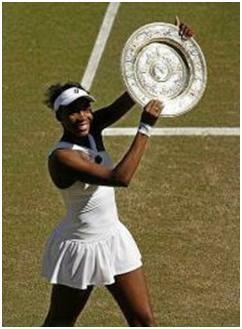 Congratulations to Venus Williams on her fifth Wimbledon victory yesterday. Actually, both of the Williams sisters should be congratulated on their magnificent play at this year's Wimbledon tournament. Venus and Serena Williams really make tennis exciting; especially women's tennis. Can anyone stop the Williams magic? Do you remember the Winter Olympic Games of 1988 and the athletic beauty of a young black woman by the name of Debi Thomas? Well, not only was Ms. Thomas a gifted athlete; she was also gifted academically. She's successfully completed medical school and is a wife and mother. Here's a retrospective, from 2006, on Dr. Debi Thomas, Olympic champion. A radiant Debi Thomas, dressed in a black sequined skating dress, stood alone at center ice in Calgary, Canada. As the last figure skater on the evening of Feb. 27, 1988, she knew she had a chance to win a gold medal for the United States at the Olympic Winter Games. The 20-year-old Thomas had halted her studies at Stanford University and trained six hours a day since July for this moment. She felt burned out, but she had decided to try a difficult triple toe/triple toe jump combination to open her 4-minute performance. The music began, and Thomas started setting up for her athletic jump combination. She stumbled on the landing, and East Germany's Katarina Witt won her second Olympic gold medal. "I had a 15-second lapse of concentration, and when I missed the combination, I thought, 'How bad would it look if I left the ice right now?'" Thomas said in a recent interview. "It was not the proudest moment of my skating career, but it also was not the end of the world." Thomas finished her program and won the bronze medal-the first African American athlete to win a medal at the Olympic Winter Games. Elizabeth Manley of Canada took second place and the silver medal. Today, Thomas, 38, doesn't dwell on her Olympic disappointment. "I have so many other more significant accomplishments that make my life complete," she says. Indeed, Dr. Thomas works these days making rounds with residents at the Martin Luther King Jr./ Charles Drew Medical Center in Los Angeles, where she is a junior attending physician repairing bone fractures and doing other orthopedic procedures. She also finds time for her husband, Chris Bequette, a financial analyst; and her 8-year-old son, Christopher, whom they call "Luc." She does volunteer work for children's charities and continues to promote figure skating. Thomas began setting high goals and striving to achieve them early in life. Born March 25, 1967, in San Jose, Calif., she went to see the Ice Follies with her mother before she had turned 4. Later, she asked for a pair of skates and began taking lessons at 5-the same age when she began telling people she wanted to be a doctor. According to Thomas, her mother, a senior programming analyst for a computer company, insisted education come first. "School was always very important to me, and I knew from a young age that I needed to be well-educated," Thomas recalls. "My mother always said, 'You have too good a mind to waste. Concentrate on your vocation, and if your avocation works out, fine.'" When Thomas was 10, her mother approached British-born Alex McGowan about coaching her daughter. He agreed and quickly improved Thomas' technical skating skills. But McGowan was based in Redwood City, Calif., and Debi and her mother had to commute everyday from San Jose for practices. "When I was growing up, she drove more than 100 miles a day to take me to skating lessons," Thomas says, "and she would work two jobs to pay for those lessons." McGowan was a taskmaster who demanded his students do exactly as he said. Thomas was an independent and strong-minded pupil. Unlike most skaters, she was determined to skate competitively and get an education at the same time. "There was a constant battle over my insistence on going to school to become a doctor some day," Thomas says. "Mr. McGowan would tell me that I shouldn't do it because I could make so much more money skating." After graduating from San Mateo High School, she entered Stanford in the fall of 1985. A few months later, she won the 1986 U.S. Figure Skating Championships, defeating Tiffany Chin. A month later, she faced 1984 Olympic champion Katarina Witt at the World Figure Skating Championships in Geneva, Switzerland. After Witt stumbled in her short program, Thomas needed to finish second in the long program to beat her. She skated a clean program and won the title. "My proudest accomplishment in skating was winning both the U.S. and World titles during my freshman year at Stanford," Thomas says. "I showed Mr. McGowan and the rest of the naysayers that I could do it." In 1987, however, Thomas lost to Jill Trenary at the U.S. Championships and to Witt at the World Championships. In early 1988, Thomas returned to form at the U.S. Championships in Denver, and defeated Trenary to win her second U.S. title. With the Thomas-Witt rivalry at its peak, the stage was set for a showdown at Calgary. Both women had selected the same music from Bizet's tragic opera "Carmen" and neither would change. The press labeled the upcoming competition, "The Battle of the Carmens," which intensified the mind games and preparation for to the Olympics. "It just wasn't meant to be," Thomas says of her loss to Witt. After the Olympics, she returned to Stanford in the fall and skated professionally on weekends. She took a demanding load of pre-medical courses and changed her major from microbiology to biology and then to engineering. Along the way, she won three World Professional skating titles. In June 1991 at 24, Thomas received her bachelor's degree in engineering and product design. In June 1997, she graduated from Northwestern University Medical School in Chicago, and last June she completed the Orthopedic Residency Program at Charles R. Drew University. Thomas plans to spend the next year studying for the American Board of Orthopedic Surgeons' exam. In July 2006, she will begin a one-year fellowship at the Dorr Arthritis Institute at Centinela Hospital in Inglewood, Calif., becoming a specialist in adult hip and knee replacement surgery. "There's really nothing you can't do if you set your mind to it and are willing to work hard," Thomas says. "The important thing is not to be afraid to try. You may fall on your face many times, as I have, but you will learn from your mistakes and, eventually, get where you want to go." More than 250 young figure skaters will do just that and set their minds to figure skating gold this winter in St. Louis, Mo. The 2006 State Farm U.S. Figure Skating Championships will take place Jan. 8-15 at the Savvis Center as figure skaters from across the country converge upon the Show-Me State to become the Debi Thomases of tomorrow.